There are a number of things concrete is known for. Firstly, it’s toughness. It can withstand tonnes and tonnes of pressure, as well as unpredictable weather and weight – that’s what makes it such a popular and sensible choice for some many homes. And while we’ve all heard of concrete, very few of us know much about it. Well, at Everlast, we know concrete. We know the ins and outs of the materials, uses, ingredients, finishes, techniques, maintenance and everything else in between. Over the years we have compiled and written an extensive amount of information on the subject, spanning an array of different subject matter. If you’re looking to verse yourself in some concrete know-how, or you simply don’t know where to start, perhaps our Top 5 Concreting Blog Posts are a good place. Cleaning concrete can be one of life’s biggest woes – but, thank god for power washers, right? This post delves into the most efficient and user-friendly way to clean those large concrete surfaces we love. It includes what you should look for in your power washer, as well as maintenance tips and tricks – perfect for those who like to do a little research before purchasing. It also delves into the details of the act, and how you can best use techniques to actually power washing your surface. A driveway is an important piece of the puzzle in your home. But as it’s often neglected, many don’t know where to start. 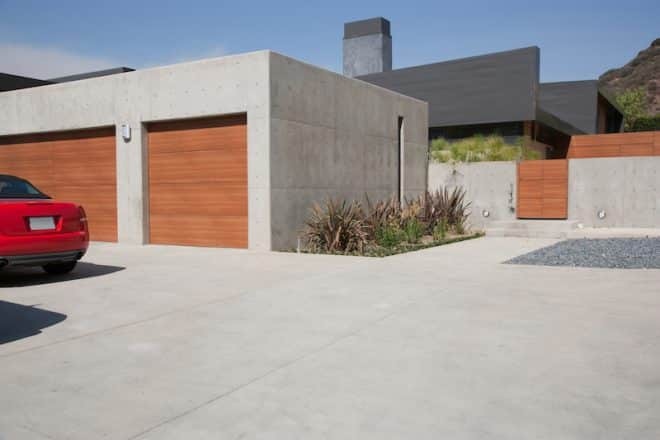 Read this post for a complete guide on the advantages of a concrete driveway – and trust us, there are many. Not only is it extremely durable, but it is offered in an extensive range of styles and colours. There’s Mediterranean, or even striking and contemporary. For an extensive catalogue of options (minus that overwhelmed, no-idea-what-to-pick feeling), read our professional guide to customising your concrete driveway. Just because the colder months in Australia are more forgiving than overseas, doesn’t make winter concrete maintenance any less important. Ensuring your concrete transcends the seasons is the key to ensuring it retains its value. And while general maintenance is low, surfaces still require a bit of care to look their best. Heavy rains and ice can be particularly tough on concrete, due to cold water seeping into the tiny pores on the surface, where temperatures drop and it expands into ice. This creates cracks, discolouration and corrosion – effects which can be extremely costly to repair. If this occurs, the state of your concrete can diminish, which will make it difficult to not only look at, but drive over. With the right Winter concrete maintenance, you will be able to keep your driveway looking pristine for seasons to come, retaining the value of your home (and pride). Attention DIY’ers! This post is perfect for those who want to learn professional concrete pouring tips, all in simple, easy to read steps. The right concrete pouring know-how in any landscaping and construction situation, can save you a serious amount of precious cash. If you can master this skill to a professional efficiency, that will be a real time and money saver. Learning the right type of concrete is usually the best place to start. You’ve got ready mix concrete, which will save time on small projects at a premium price. You have transit-mix concrete, which requires a revolving barrel. And you have mix-it-yourself concrete – the cheapest but the most labour intensive option. If you’ve gotten this far but find yourself stumped at what to do next, we suggest you read the post. While people love the look and value that a good concrete surface can bring, they seriously underestimate the process. Well, the reason for its aesthetic beauty, durability, toughness and venue for money all comes down to the extensive process that goes into perfecting it. From the moment you prepare the concrete, to the moment you finish it – it’s all about attention to detail. This post will give you a complete guide to finishes, allowing you to give it a special tough that raises it above a slab of water, aggregate and cement. If you can perfect your finishing techniques, your concreting projects will exist in a league of their own.